There’s a recipe for success on the Lower Klamath River, which hasn’t been met just yet. Fortunately, that’s poised to change in October as temperatures fall and more fish enter the system. There are a lot of things that can happen for the bite to take off down here. Most important is we need to see much cooler water and a lot cooler air temperatures in October and I’d like for this algae bloom we are seeing now to clear up. I’m really thinking we are going to get a decent push of fish in October. Up until the ocean closure on September 8th the guys were still catching easy limits. 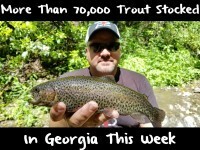 There’s still a ton of fish out in the ocean and those fish need to come up the river. August and September could best be described as decent. Salmon came, at times, and it’s been slow others. Right now we are only getting short spurs of fish instead of the big waves like we normally do. If the mouth of the Klamath was open more and the algae bloom was gone we’d be getting a lot of fish. The fish are in the ocean, at the mouth and in the estuary, but they haven’t come upriver in big numbers. A lot balances on temperature. If it drops below the 68 degrees, where it is now, good things follow. Right now, we are getting two to five hookups a day. Those are salmon and there’s a few steelhead here and there. 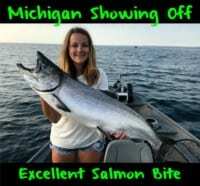 Steelhead are running 5-7 pounds and the salmon are jacks to 25 pounds although most of the fish are 12. On the other hand, I’m pretty sure if the algae died off and we dropped two or more degrees the fish would really start biting. The salmon don’t like anything over 66. I think it gets down below that, and the water clears a little, and the bite will take off. There’s still a lot of fish to come. Cooler nights, shorter days and nighttime temperatures dropping into the 50s should bring river temperatures down. It’s also important that they fall in Redding and Klamath Falls, both upriver towns. Lower temperature up there translates into cooler water down here. Warmer water might have postponed the excellent fishing we expected, but we are still catching fish everyday. I’m expecting a great October. Barring a big storm salmon fishing will be consistent. We will have fish here through October. The only thing that would hamper catching fish would be a big rain. If we get one that drops two inches it’ll blow out for a day and come back around, but if we get five we’d be done for the season. For the reminder of the season I’ll be side drifting and boon dogging holes with roe using a 15-pound main line of P-Line CXX with a 10-pound P-Line fluorocarbon leader and an Owner Size 2 mosquito hook. I’m still catching all my fish by mixing red Fire Cure and red BorX O Fire. It’s given me the perfect egg. Mixing the two is giving me a tougher egg and with the water temperatures being up the tougher egg is keeping the egg together longer. The BorX O Fire is helping with these warm temperatures around here. You need to use an egg that’s firmer or you’ll have to bait every drift. A wet eggs turns into like a piece of snot, but the borax keeps it firmer. Editor’s Note: Pautzke pro Alan Borges operates Alan’s Guide Service (707) 496-9074 on California’s North Coast. 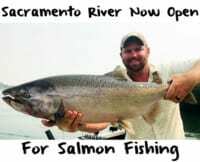 For more info on his Klamath River trips please visit http://www.alansguideservice.com/.